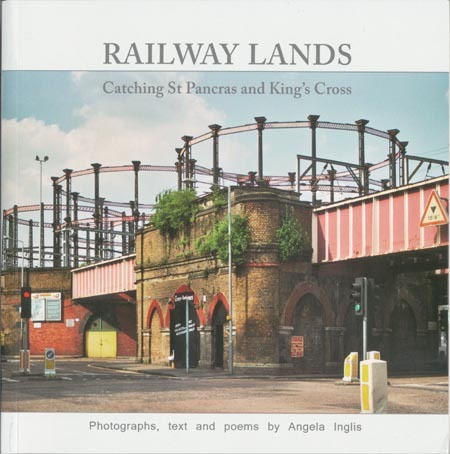 I was pleased I made the effort to attend the launch of Angela Inglis’s book ‘Railway Lands‘ last week. Strolling to Old St Pancras Church down Crowndale Street from Mornington Crescent, past the Working Mens’ College I relived some old memories. Many years ago my student card there saved me more on photographic materials than the cost of the evening class. Out of habit I turned to wander into the old burial ground, then remembered it was no longer the place it used to be, derelict, gloomy, foreboding, and at its best in rain and fog, but now a tidy and ultimately depressing garden, and kept straight on for the church, also considerably restored and now bright and cheerful and full of people. Inglis’s photographs (see her web site) were arranged on the shelving around the body of the church and included some fine large prints, but they were rather hard to see for the bodies, many seated on hard church chairs perusing copies of her book just purchased. It was certainly a volume that seemed to arouse some intense local interest, and this was not surprising. Local archivist Malcolm Holmes gave the book an enthusiastic welcome, in particular because it dispelled some local myths as well as recording the developments. Holmes was an appropriate choice, with a considerable amount of the information in the book from the borough archives for which he worked, but also because essentially this is a work firmly bound in local history and a pictorial view of the area. My own approach to the area, perhaps since I do not live locally, has been more concerned with the wider political and environmental issues the development raises, as well as from a long interest in industrial archaeology. I was involved in the early years of the Kings Cross Railway Lands Group http://www.kxrlg.org.uk/group/history.htm set up to oppose the development plans in 1987 which published its award-winning ‘Towards a People’s Plan’ in 1990, and have followed with interest the political and legal developments over the years, although from a distance. In 1989 I was fortunate to tour and photograph parts of the railway lands site in a GLIAS (The Greater London Industrial Archaeology Society ) group led by Malcolm Tucker, who wrote the section on Industrial Archaeology for the London 4: North volume of ‘The Buildings of England‘ that deals with this area. It was good to see him again at the book launch, along with others from GLIAS, which has done much to raise the general awareness of the importance of understanding and preserving our industrial heritage  including not least the gas holders and railway infrastructure of this area, and who could have provided some rather more authoritative input on these aspects than the magazine article quoted in the volume. Obsession is always a good thing in photography, and I can only applaud Angela Inglis for her decision to photograph the area and her dedication to the task over a number of years. Her extensive coverage  the book has over 250 pages packed with pictures, but presumably is only the iceberg-tip of her archive  appears to have started around the year 2000 (a few earlier images generally appear more ‘arty’ than documentary) and continues until April 2007. Of course many had previously photographed the area  and particularly its gems  and there is some fine work from the 1920s and 1930s. A chug through my own database tells me I first took pictures in the area in 1978, and rather more when it became clear in the mid-80s that extensive redevelopment was bound to take place. When I came, there were indeed some streets in the area where it seemed rare to walk and not see a film crew at work or a photography student practising architectural photography skills with a view camera on a tripod. But what is particularly valuable about Inglis’s work are the images of many often overlooked details and in particular those that show not how it used to be, but the area in transition, the record of its destruction and redevelopment. As a book, I feel this would have benefited from a stern editor. Photographers are not always the best editors of their own work (as most of my own projects demonstrate), nor are writers and poets, and Inglis performs in all roles in this volume. However she is to be greatly applauded for this book represents a major investment in both time and money. A few of the images do seem let down by the printing. Some of the later pictures in particular seem a bit muddy, and others  such as the view of Kings Cross from Camden Council offices and Pancras Road and railway bridge, May 2000  noticeably lack sharpness; at least one (p18-19) seems to have been printed from a screen layout file rather than one at print resolution. The book has two useful fold-out maps of the area in 1999 and 2005 at front and rear, but I did at times feel that the design, particularly the handling of text, was a little lacklustre. Overall however the production is certainly better than most works of local history. The book also has some surprising omissions. There is very little coverage of the part of the site to the north of the canal, and both the Granary, one of the finest buildings in the area, and the Eastern Coal Drops are entirely absent, but the book remains a valuable visual record of an important area in a time of considerable change, and is a volume that anyone with an interest in the Kings Cross/St Pancras area will want. This entry was posted on Monday, September 24th, 2007 at 02:46 pm and is filed under Photographers, Reviews etc. You can follow any responses to this entry through the RSS 2.0 feed. You can leave a response, or trackback from your own site.